Italian filmmaker Franco Prosperi can partially be blamed/lauded for creating the brutal thrust of the classic Italian gore horror film. It was Prosperi who, along with his partner Paolo Cavara and Gualtiero Jacopetti gave us the “shock doc” classic Mondo Cane, its sequel and the even more brutal and polarizing follow-up cultural exploitation films Africa Blood and Guts and Goodbye Uncle Tom. These pictures aimed to explore primitive cultures and damning social horrors, often by being complicit in the acts themselves, including voyeuristic passages of authentic animal abuse. The Italian cannibal films sculpted by directors Umberto Lenzi (Cannibal Ferox) and Ruggero Deodato (Cannibal Holocaust) were perversions of these reality-based movies and themselves rightly came under fire for their own blending of fiction and reality, with real animals being executed brutally in the middle of their gauzy, gory narratives. In the case of Cannibal Holocaust, this writer still cannot handle seeing that beautiful tortoise being eviscerated alive. Horrible stuff. But Prosperi would break out from his shockumentary world and make his own feature fright film in 1984 with Wild Beasts, a riotous horror movie that features animals rising up against their human “rapists” and tearing, stomping, chewing and shredding them up. Now, Severin Films have released this film for the first time on Blu-ray and revisiting it again, especially when stacked against the Lilly-livered wave of contemporary genre films is a revelation. Because Wild Beasts is a jaw dropper: strong, strange, outrageous, revolting, surreal, funny and often borderline offensive. It’s an overwhelming experience. Wild Beasts sees a strain of lethal PCP leaking into the water supply of an Italian city zoo and other nearby institutions. Very quickly, those majestic beasts (and they truly are beautiful), which include elephants, cheetahs, tigers, lions, a charming and angry polar bear and even the lowly rats that scurry on the sidelines, go completely insane and opt to band together and kill their captors and any other warm blooded human that dares get in their way. 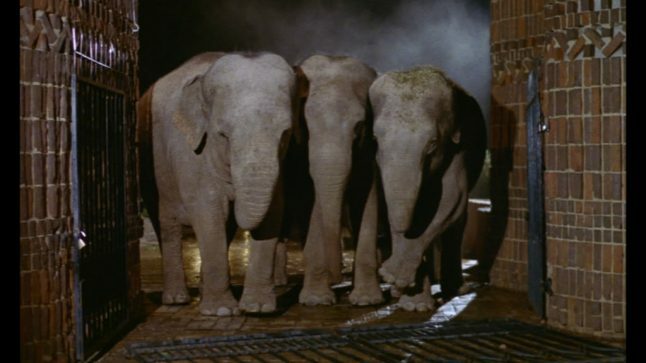 That’s the film in essence and Wild Beasts‘ greatest joy is certainly to watch those lovely animals (who were supervised by circus folk…animals rights fans will have to view this as an artifact of its time and place and be very forgiving of its likely transgressions) in action. But what makes the movie more than just a meat and potatoes Eurotrash mash is Prosperi, who brings an art, grace and larger-than-life voyeuristic leer to it all. Mondo Cane and the horror movies that it inspired were famous for juxtaposing their visual brutality with blankets of lush, dreamy and often moving music, often composed by the great Riz Ortalani. The ultimate effect was to heighten the emotional impact of the sequences and give them a kind of poetry. And Prosperi applies that same aesthetic here, with a wild, sometimes groovy, sometimes mournful score by Daniele Patucchi (who scored the first Italian cannibal film, 1972’s The Man From Deep River). During the films many, many kills, the director opts to kill the audio, slowing down the motion and turning up the music, every rip of skin and spurt of blood somehow becoming a lyrical, wrenching portrait of inhumanity and deeply sad tableaux of the temporal nature of life. Or maybe this writer is reaching. I don’t think I am. But maybe. Either way, even if you don’t buy the read that Wild Beasts is a kind of mentalcase art film, it’s undeniably a great horror movie. Scenes of rats literally devouring a horny couple in a car are horrifying and revolting. Shots of crazed elephants bursting through brick walls to stomp their victims are absurd and unlike anything seen in any genre movie, ever. Watching a wild-eyed tiger massacre the passengers of a stalled train is pulse pounding and ludicrous. And watching a woman gun it down the road on a dead street while a cheetah tries to chase her down are maniacally hilarious. And because almost all of the movie takes place at night, much of Wild Beasts is really quite…scary! Yes, despite the madness of the movie itself, there’s a genuine single-minded relentlessness and nightmarish quality in the film that conquers anything seen in comparatively “normal” Italian movies of the period. 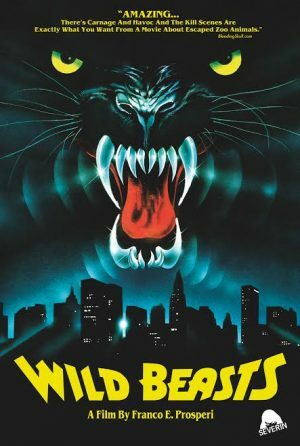 And yes, Wild Beasts does make even demented stuff like Joe D’Amato’s Anthropophagus or Fulci’s The Beyond look normal. I worship Wild Beasts and as usual, leave it to Severin to give us such a loving, detailed and reverent package, including an in-depth peek into the world of the late, great Prosperi, including a great Italian language interview and a visit to the man’s home(!) and a freaky look into the Italian circus industry. You also get a funny chat with actor Tony Di Leo and a look at the art of the shockumentary. From its opening frames of a dead horse (is that a vulgar joke alluding to Prosperi beating his own dead shockumentary horse?) being fed to the hungry creatures who will soon rise up, to its final shocking moments, this is a major work of Eco terror and perhaps the last truly great Italian horror movie of the Golden Age. A must see. And you can pick up Wild Beasts at Amazon now.